The Fed may have raised its GDP projection for 2018, however, bad omens for US growth are starting to mount. 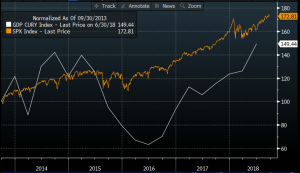 The Markit PMI report for September saw a steep decline in the composite index, which fell to its lowest level since June 2017. 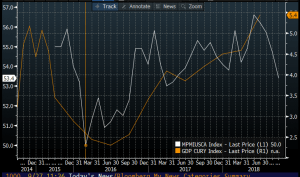 As you can see in chart 1 below, the Markit PMI index has a strong positive correlation with US GDP. Thus, the decline in the PMI survey does not bode well for US growth. As we mentioned in our Fed notes on Wednesday evening, the Fed’s upward revision to the 2018 full year GDP report points to a sharp slowdown in growth in Q4, to the tune of 1.3%. Thus, investors should get ready for a slowdown in the US economy. As you can see in chart 2, GDP matters for the performance of US stocks. Chart 2 shows the S&P 500 and YoY US GDP. The chart has been normalised to show how they move together. As you can see, US GDP and the S&P 500 tend to move in the same direction. As US GDP has jumped to some of the highest levels in the developed world in recent quarters, the S&P 500 has reached record highs. Likewise, as GDP dips it tends to lead to a period of weakness for the S&P 500. If this relationship holds, as we expect it to, then as GDP moderates the S&P 500 could come under pressure. We could see the S&P 500 struggle as early as next week when we get the start-of-the-month data dump, including official PMI data and US payrolls. If this shows a moderation in US growth, then US stock performance could be at risk.